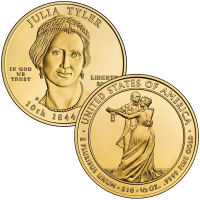 The 2009-W $10 Julia Tyler First Spouse Gold Uncirculated Coin is the eleventh coin in a series dedicated to the spouses of former Presidents of the United States and the second to be associated with the tenth President John Tyler. John was actually married to another woman, Letitia when he first assumed the office but she passed away in his second year. John then re-married Julia making her the second spouse affiliated with his tenure. The legislation that authorized the series made the provision that if a President had more than one spouse while in office, both would be honored on separate coins. The US Mint also produced proof quality versions of these coins. Each First Spouse Gold Coin is struck from 1/2 ounce of 24-karat gold (.9999 fine). 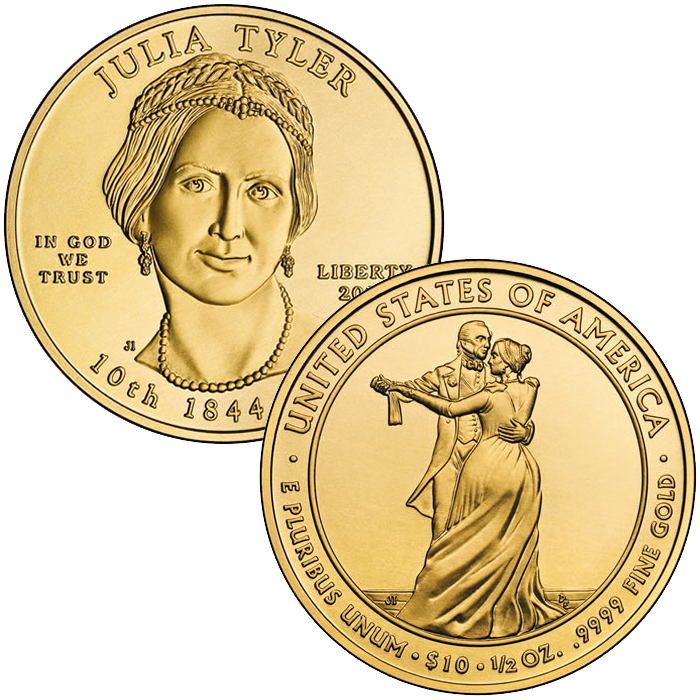 The US Mint released the Julia Tyler coins on August 6, 2009. Initial price on the Julia Tyler Uncirculated Coin was $616. The portrait of Julia Tyler found on the obverse (heads side) of her coin was designed by Joel Iskowitz and sculpted by Don Everhart. An image of Julia and John Tyler dancing at a White House Ball is found on the reverse (tails side) of the coin. It is also the work of Iskowitz and Everhart.